Rolex - Country of Sale. 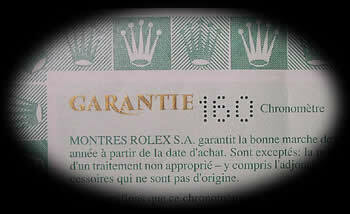 On most modern Rolex Guarantee/Warranty papers you will find 2 perforated numbers, one of these numbers is the watch’s serial number and is located (on UK Guarantee papers) in the top right hand corner. However there is a second perforated number which is made up of 3 digits (pictured left) and this represents the County in which the watch was first sold. Below you will find a list of these Codes with their associated countries but of course if you are in possession of the warranty papers, and they have been fully completed, this information will already be obvious to you. I would be interested to hear of any other codes not listed here, and also of any corrections that may be appropriate if anyone out there has spotted inaccuracies in the information being provided. Rolex USA - Date Shipped to Dealer. So the code illustrated above (A OXCR) translates as 7 2591, i.e. July 25 1991.... simple when you know how! My thanks go to Jocke for the photo of the red code and the information that goes with it.